Recall that the Caesar cipher only had 26 possible keys. It’s not very secure - easily bruteforced, as you have already written a script for. The Transposition Cipher is slightly more secure, because its possible number of keys depends on the length of the message. always code as if the guy who ends up maintaining your code will be a violent psychopath who knows where you live"
And let’s use a key of 10. 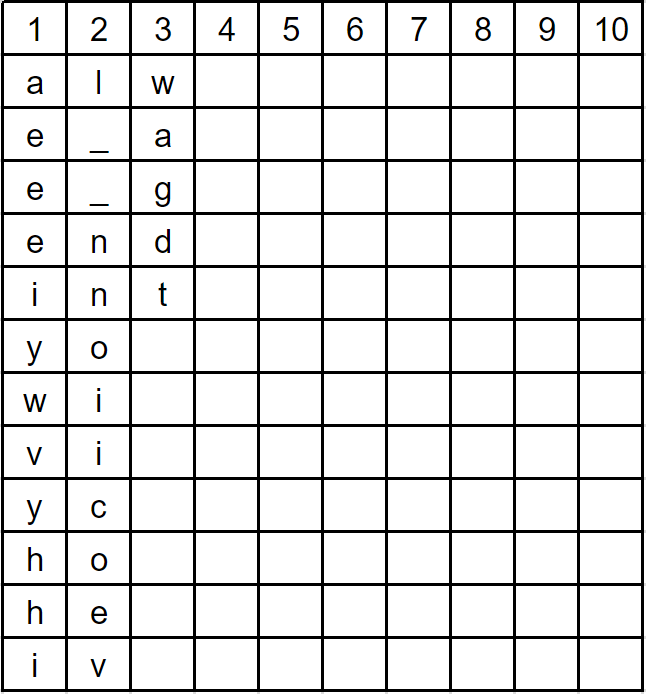 Then we begin writing our message, one character at a time, going across each row. If we reach the end of a row, we just continue on the next one. For spaces, I put underscores _ so it is be easier to see. 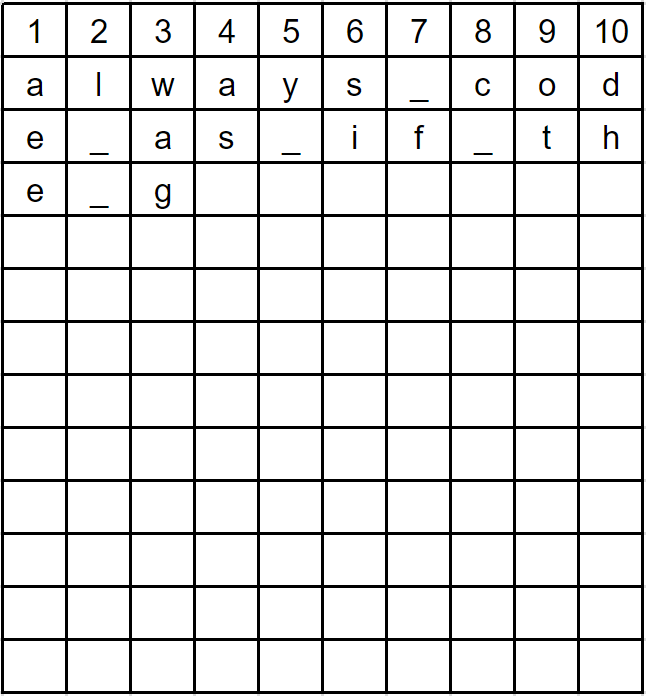 We continue this process until the entire message is on the grid..
And now, to encrypt it, we just writing the letters, starting with the first column, then with the second, and so on. Seems pretty random, right? It has a few advantages over the Caesar cipher other than having more possible keys; it also cannot be broken through frequency analysis (looking at how often certain letters show up), which would work on many substitution ciphers, including the Caesar cipher. It will also mix up punctuation and spaces, which the Caesar cipher will not. 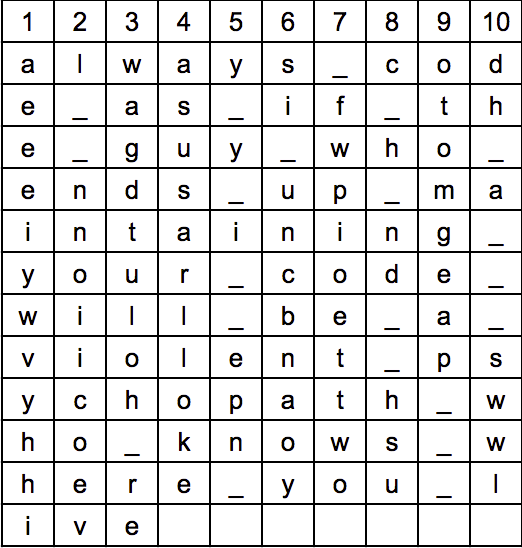 As long as you know the key, decrypting with the Transposition Cipher is easy. It uses a very similar method as above, except reversed. Start by getting the length of the message and divide it by the key, or 10. The length of this message is 120 characters (if it were an unpadded message, you would always round your number up), and so we divide the message into pieces of length 120 / 10, or 12. 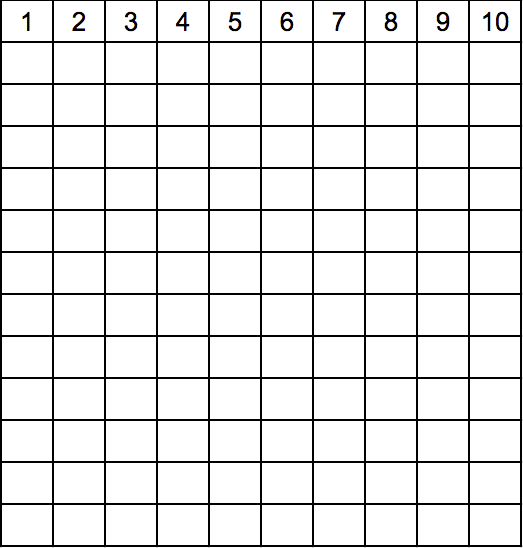 Then draw up an empty grid 10 columns wide. 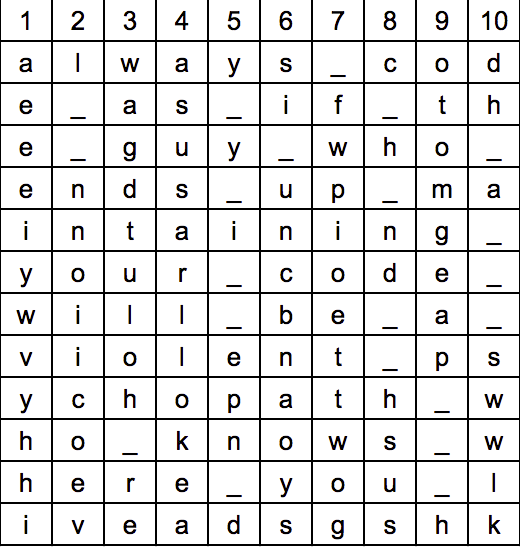 Then begin filling in the grid with these messages, except this time, you’ll want to write down and not across. Each 12-character substring should fit into one column. Then we read off the message going left-right, top-down, and the original message is once again clear! In the next lab, 6-2, you will be implementing the algorithm for encrypting and decrypting with the transposition cipher.